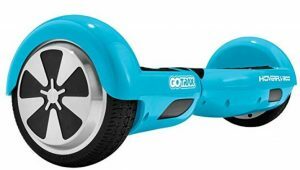 Looking for the best blue hoverboards or self balancing scooter in 2019? No matter what age you are, a hoverboard is sure to spice up the way you travel. These are basically self-balancing scooters that you can ride around at any time. Furthermore, unlike a bike, you never have to worry about them getting stolen. This is because they are compact in size and can be easily carried. It helps you save up fuel and beat the traffic at the same time! We’re here to help you pick the best blue hoverboards of 2019. Why blue? Why not? This color is as soothing as it is attractive. You’ll have heads turning wherever you go. While black may be a classic, it tends to be boring and dull. 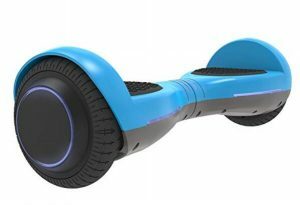 With a blue hoverboard, you’re bound to stand out! 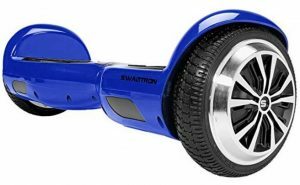 If you’re looking for a blue electric hoverboard, it doesn’t get better than the Swagtron Swagboard T1. The hoverboard is safe, reliable and fast to say the least. 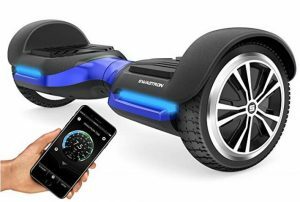 The Swagtron Hoverboard features a 500 Watt motor that helps you achieve a top speed of about 8 miles per hour so you can race ahead of everyone. It includes a patented Sentry Shield battery management technology that provides protection to the battery and the hoverboard. Furthermore, the electric battery holds enough charge for more than 12 miles. The charging time is quite low as well, at about 1 hour. Also included is a battery indicator to tell you how much juice the board has left. Moreover, the T1 includes a learning mode and a standard mode. The learning mode makes it easier for you to get used to the speed. What’s unique about this hoverboard is that it is UL 2272 certified which keeps it safe from all kinds of electric malfunction such as overheating and overcharging. The body is fire-resistant and features a Stop Safe Technology where if you run out of battery, the board will halt slowly and safely. To help illuminate your way into the night, the Swagboard comes with an LED light! Fast speed and long range. Includes a battery indicator and LED light. Rubber fender guards can be a little flimsy. If you’re willing to dish out a few extra bucks for a little more bling on your board, then the Swagtron Vibe is perfect for you. 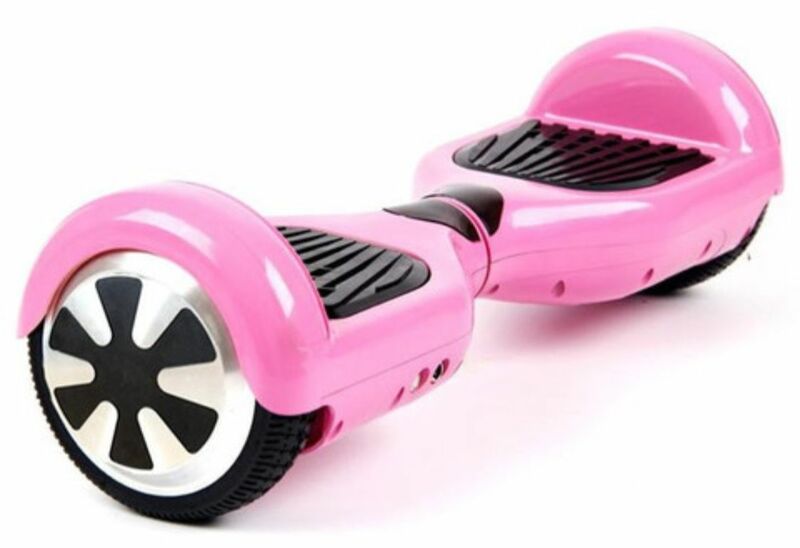 It features LED lights, Bluetooth, speakers, all with the features of a traditional hoverboard. The Vibe is as powerful as it is packed with features. It includes powerful 200 Watt dual motors that allow you to reach a maximum speed of 7.5 miles per hour. What’s truly unique about the Vibe is that it is Bluetooth enabled. This means you can play music during your ride or check the map without needing to take your phone out. In fact, it has built-in speakers to allow you to jam to your anthem while commuting. What’s more is that the scooter is extremely simple to start, stop and steer. Furthermore, the pedals are easy-grip and will ensure that your foot never slips. While the scooter itself weighs merely 20 lbs, it can easily carry up to 220 lbs. The integrated LED lights indicate movements and also act as a battery level indicator. They make it easier to travel during the night. All this and yet the battery can hold up to 8 miles of charge. All you have to do is charge it for 2 hours and you’re good to go. Features multiple safety features to protect from overcharging and overheating. Includes Bluetooth, integrated LED lights and speakers. Easy to start, stop and steer. Can be a little complicated due to various features. Another one from Gotrax, the Hoverfly Ion Hoverboard is perfect for all kinds of riders, regardless of age as it can carry a weight of up to 200 lbs. The Gotrax Ion is a self-balancing hoverboard even if there was no rider on it. This makes it easier to ride it without falling off. You need only turn it on to activate the self-balancing mode. It moves with the weight of the body so the navigation is pretty intuitive. Also included are 200 watts dual motors that power the scooter and help it to deliver 7 mph of power. Also included are blue LED lights inside the wheels that pulse with every move. Apart from that, the scooter includes two headlights that make it easier to commute during the night. Moreover, the vehicle is UL certified which means you never have to worry about overheating or overcharging the battery. However, the battery doesn’t last very long. The range is merely about 3 or 4 miles in a single charge. Also, it takes a long time to charge, i.e. about 4 hours. The wheels are quite large in size, about 6 inches which further add to the overall stability of the scooter. Perfectly self-balances with or without a rider. LED lights make it easier to commute during the night. UL certified to ensure safety. Slower than others on this list. The CHO Electric Smart Hoverboard is perfect for commuting during the day or the night. Just because it is more affordable than others, it doesn’t mean it compromises over its quality in any way. The CHO Hoverboard is all about safety and reliability. In fact, the vehicle is specially tested and certified by UL 2272. It meets all the required standards when it comes to electric performance. You never need to worry about your house going up in flames. Furthermore, it uses high intensity LED lights which make it safer for you to travel during the night. Also included are built-in wireless speakers which can be connected to any mobile devices. This makes it easier to enjoy music or listen to your favorite book, without the hassle of headphones. The wheels are about 6.5 inches which grant it better stability and include vacuum tires which can never puncture. Moreover, the CHO board features a maximum speed of about 10 km/hr while it can easily reach a range of 12 km within a single charge. However, it takes quite long to charge, about 3-5 hours so, you might need to be careful during your travels. UL Certified and meets all-electric performance standards. Can be used during the day or night. Large, durable tires for better stability. Takes too long to recharge. 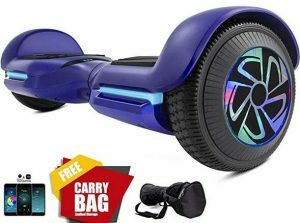 Another one from Swagtron, the Twist Hoverboard can help provide you a powerful joyride. With exclusive features such as startup self-balancing, the scooter delivers an open invitation to you to enjoy a high-quality ride. 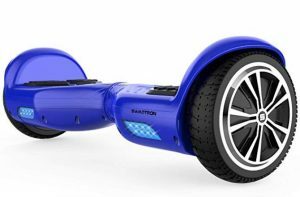 The Swagtron features a durable ABS casing which can travel through the toughest of tracks with ease. In fact, the polymer casing is UL certified to brave through the toughest of shocks, drops, and crashes. Its startup self-balancing feature allows for easier mounting and dismounting. This also makes it easier for kids to balance themselves once the power is turned on. Also included are a pair of 250 W motors that deliver tremendous power to the vehicle. It can help you reach maximum speeds of about 7mph. On the other hand, the Lithium free battery can travel for 4.8 miles on a single charge. What’s more is that the T881 can easily climb slopes of up to 30 degrees with ease. The system indicators help you keep track of your battery while the headlights help you illuminate the path ahead. The best part is that the hoverboard is quite convenient to transport due to its compact and lightweight design. The self-balancing feature allows for better stability and balance. Durable material and UL certified body. Includes battery level indicators and headlights. Doesn’t hold a charge for long. In love with monster trucks? Want to hit the dirt roads in monster style? 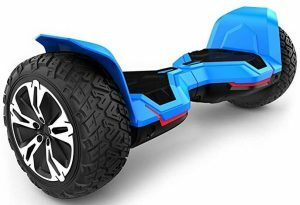 The Gyroor Warrior Hoverboard is an all-terrain scooter that can help you conquer the bumpiest of roads in style. The Warrior features 8.5-inch large tires that include UL approved material construction. This grants the vehicle with the ultimate durability so it can travel over all kinds of dirt roads with ease. Also included is a powerful 700 Watts motor that ensures a smoother ride every time. The Self-balancing technology used by the Gyroor Warrior ensures that you can ride safely without worrying about losing your balance. All you need to do is switch on the button and the Warrior will automatically balance itself. Furthermore, the hoverboard includes built-in high-quality speakers where you can play your favorite songs and music. The UL certification means that the Warrior has passed through intensive safety tests and has come out a champion. Moreover, due to the powerful motor, the Warrior can actually achieve a maximum speed of 9.95 mph. The battery merely takes an hour or two to charge and can last anywhere from 8 to 10 miles. A powerful dual motor system that ensures fast speeds. Conquers all types of off-road terrains. Charge lasts longer and can be easily recharged. Very heavy at 33 lbs. It makes a lot of noise when starting up or during the rides. If you’re looking for a more sci-fi looking scooter, the Spadger Premium hoverboard certainly looks the part. Equipped with a durable body and high-intensity headlights, it is perfect to help bring out your geeky side. Not only is the Spadger reliable, but is safe as well. It is built with a durable and anti-fire material which means you don’t have to worry about any electrical messes. 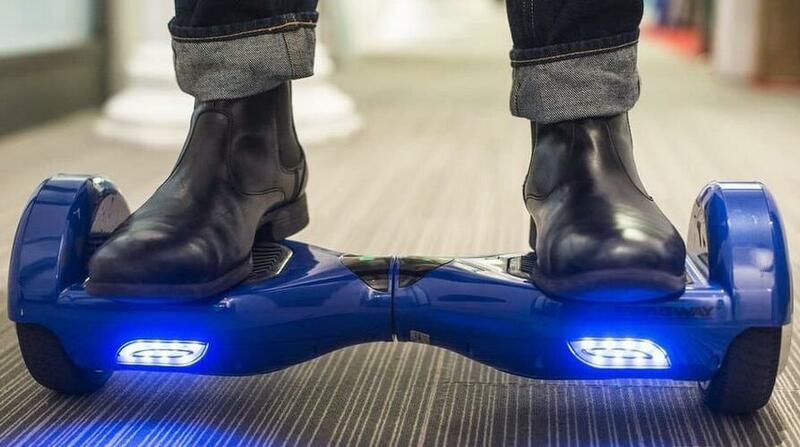 In fact, the hoverboard is UL 2272 certified to ensure customers’ safety. The UL certified hoverboard includes twin 250W motors each of which provides the craft with immense power. This way you can easily attain about 7.5+ mph. Furthermore, the battery can hold a charge for about 6-8 miles and can easily carry a weight of up to 220 lbs. Furthermore, the 6.5-inch tires are large enough to easily support the rider’s weight and provide him with stability. The 2 front LED lights are perfect for illuminating the way during the night. Lastly, the Spadger comes with Bluetooth enabled speakers to help you enjoy your journey to the max. Another UL certified hoverboard is the Gotrax Hoverfly Eco. This hoverboard is jam-packed with various features, yet it is still easy to learn and use. The Gotrax Eco includes a powerful yet durable 250 W motor that grants it a maximum speed of 8MPH. The self-balancing scooter provides you with excellent mobility and navigation. It features a leaning standing motion that allows your body to control the scooter. In addition, the device features intelligent tilt protection that helps the scooter to balance itself. This provides you with ultimate control. The added stability is brought on by the gyroscope that helps keep you upright. The heavy-duty motor can easily support a maximum weight of 275 lbs. Also included is a 15-degree angle for climbing inclines making it effortless to go up and downhill. Worried about damaging the scooter? Well, the rugged housing is water resistant which means you can use it outside in all kinds of weather. To add portability to the unit, it comes with a carrying handle as well. Moreover, the rechargeable battery allows you to travel for up to 14 miles on a single charge. However, it does take about 2 hours to recharge itself. Includes tilt protection to always keep you upright. Long range on a single charge and a fast speed. Portable and easy to navigate. Takes a long time to recharge. Annoying beeping sound when you ride it. All in all, all of our top 8 choices are bound to amaze you. They are all designed to help you travel safely. However, the Swagtron T1 Swagboard seems to stand heads and shoulders above others. We highly recommend it due to its reliable and durable design. Not to mention that it has a battery that can last for a long time and is easier to recharge. If it’s a little too expensive for your taste, then perhaps the Gotrax Hoverfly Eco will be the perfect option. It’s suitable for those who want to hold back on their pockets without compromising on the quality.